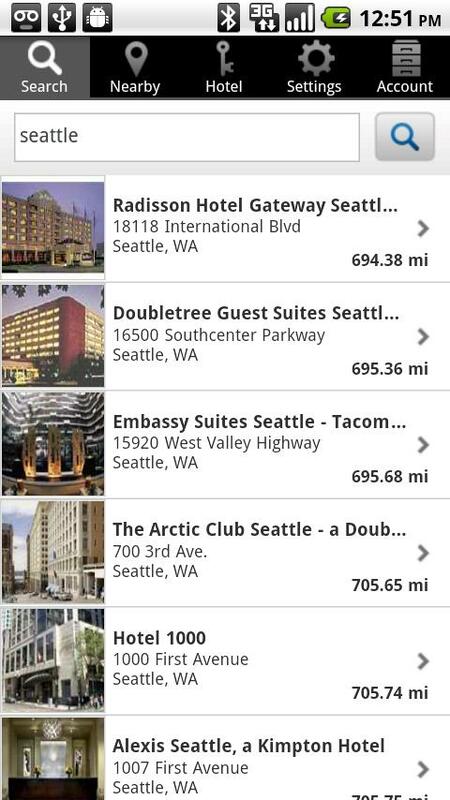 Searching for the perfect hotel room gets a little bit easier today with Room 77 finally arriving on Android. 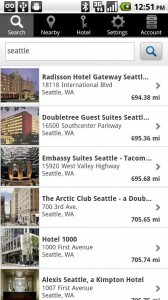 The hotel search tool has been available for other platforms for a while now and has become highly rated since leaving a public beta earlier in the year. Room 77 lets users search hotels and rooms, view floor layouts, browse user-submitted photos, see a virtual ‘room view’, and more. The location-based feature returns available hotels and the corresponding available rooms should one find themselves in a new town and not knowing where to go. One of the features we found to be most helpful is the “heard in the lobby” notes which provide tidbits of useful information such as which rooms have a specific view, which are generally bigger, and other insider tricks. To help get things started with a bang, Room 77 is giving away one $25 gift card per day from today August 10th, through August 31st. Submit a hotel room photo or room view photo between now and then and you could be one of the randomly selected winners! Room 77 is free to download and works on any Android device with 1.1 or higher. Yeah, that means you pre-Cupcake folks can get in on this! Download links, images, and press release after the break. Mountain View, Calif. – August 10, 2011 – Room 77, the world’s first hotel search engine to reveal room-specific details, today announced its popular, free mobile application is now available in the Android Marketplace and works with the most popular Android devices available today. Now, travelers with Android devices as well as the iPhone, iPad and iPod touch can find and share important information on hotel rooms to secure the best room for their needs. Room 77’s mobile app is particularly useful while checking in at a hotel’s front desk – a traveler simply enters the room number offered by the clerk and Room 77 instantly advises whether to “take it” or “leave it” and presents alternate room suggestions. Users can also search nearby properties, based on their current location, or browse hotels in another destination. As with the website, travelers using a mobile app can also search a range of rooms best-matched to their preferences and check out the simulated Room View, which uses proprietary mapping technology to generate the actual view as if you were standing at the window. 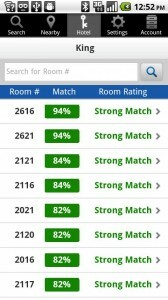 The Room 77 Android App also includes several new features that have been added to the mobile platform since the company’s public beta launch in February, including user registration, which validates the user’s info and makes sharing room data, images and exit floor plans with Room 77 via the app easier and faster. Users simply register with Room 77, snap photo(s) of the room and add tags, rate the room on a few key measures, and then click submit to share their review and photos with other Room 77 users. Mobile users also now have access to Room 77’s Look Inside feature, which provides interior photos, either submitted by a hotel or a traveler, allowing travelers to peek inside a particular room before they check in. 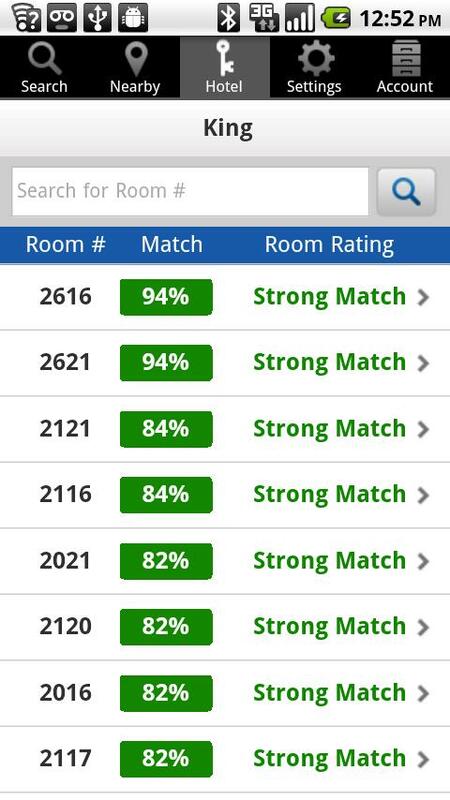 Room 77 is working to index every hotel room at every three- to five-star hotel and resort worldwide and has data on more than 500,000 hotel rooms in nearly 30 markets, including the most recent destinations added earlier this month: Austin, Texas; Portland, Ore.; and Toronto. Additional cities include: Atlanta; Boston; Chicago; Denver; Fort Lauderdale, Fla.; Honolulu; Las Vegas; Los Angeles; London (UK); Maui, Hawaii; Miami; Minneapolis; Montreal; New Orleans; New York; Orange County, Calif.; Orlando, Palm Springs, Calif.; Philadelphia; Phoenix/Scottsdale; San Diego; San Francisco; San Jose / Silicon Valley, Calif.; Seattle; Vancouver (CAN); and Washington, DC. To commemorate the Android app launch, Room 77 is giving away one $25 gift card per day from August 10-31 to a randomly selected traveler who submits hotel room photos or room views during the month of August through the Room 77 mobile app (includes Android and iOS users). Winners will be notified by email.